1. In a dutch oven, over medium-high heat, saute carrots and shallots in bacon fat until tender. Stir in thyme until fragrant, then add roasted red peppers and tomatoes. Stir and cook for about 3 minutes. 2. Scrape everything into a blender and add 1 cup of chicken stock. Loosely fit the lid on top, allowing a way for some air to escape. Slowly start to blend and continue until all ingredients are pureed. 3. Scrape puree back into the dutch oven and add remaining chicken stock and bay leaf. Bring to a boil, then simmer for 10-15 minutes. 4. While the soup is simmering, prepare your grilled cheese. You can make this healthier by toasting the sandwich in a toaster oven without butter instead of pan frying it. 5. Finally, still the half and half (or sour cream) into the soup just before serving. Garnish with bacon bits. This roasted red pepper tomato soup is going to rock your world! I’ll share with you my simplified cooking process and also show you how to make the perfect grilled cheese sandwich to pair with this soup. 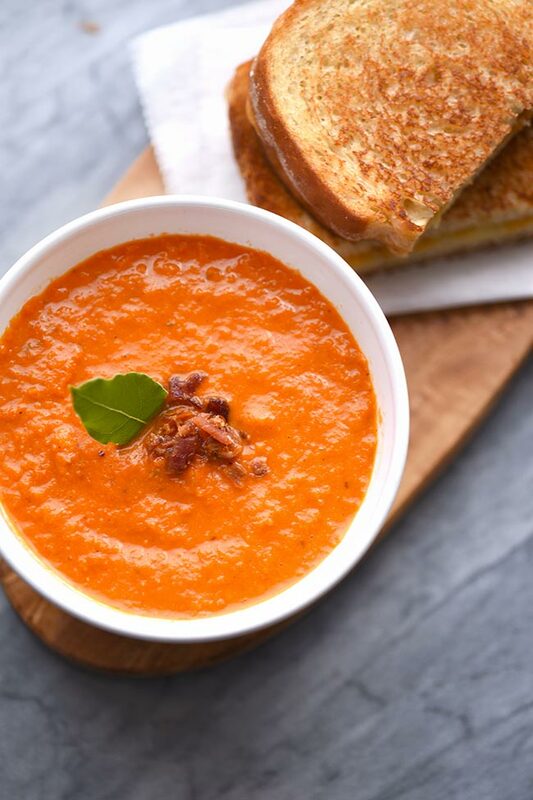 Let’s talk real quick about the tomato soup and grilled cheese combo. Tomato soup served with grilled cheese is a thing here in northern PA and someone told me that’s because it’s a Canadian thing. The only evidence I’ve found to back this up is that Tim Horton’s promotes this tasty combo and Tim Horton’s is in fact, a Canadian company. So, if you’re from Canada, please weigh in. Is this a dish that you all grew up on? What’s the story? Other than tomato soup and grilled cheese being an awesome combination of flavors, I figure there must be some sort of fun story behind where this meal originated. Like, hockey moms packing it for their family or something like that. Help me out! I need to know. My good friend made a batch of tomato soup for dinner during a recent visit and it was so good. I knew I had to make it an post about it even though it’s nearing the end of soup season. She used a recipe she found on Pinch of Yum and it was delicious! So this is an adaptation of that recipe, just with a few tweaks because I can’t help but feel the need to change things up. The grilled cheese is key for dipping and for making sure you’re nice and filled up. Plus, not really a “recipe” per say, but I am sneaking in one of my favorite ways to make grilled cheese which is with sour dough bread and shredded cheddar cheese. Sliced cheddar works too but shredded cheddar cheese adds some airiness to the sandwich that totally ups the yum factor! What things can you add to traditional tomato soup? You can add a few ingredients that will really add some flavor and also simplify the cooking process. I’m also looking for shortcuts, ya know? I sauteed using bacon fat instead of butter or oil because it’s 1.) delicious and 2.) I always save that stuff and then forget to use it! So I’m happy when I find a use for it. I added in some roasted red peppers because they go nicely with tomatoes, add a bit of sweetness and another layer of flavor. And finally, I simplified the cooking process by just using a shallot instead of the usual onion and garlic. A shallot tastes like a cross between an onion and garlic, so why not just use that?! If you don’t have a shallot on hand though, just use garlic and onions. Whether your vegetarian or not, or maybe you’re giving up meat for lent or another reason. In an case, it’s easy to make this tomato soup vegetarian. You can simple swap bacon fat for butter and leave off the bacon topping, or you can use a meatless bacon substitute. There’s a large variety of meatless bacon available. Shop meatless bacon now on Amazon. One last tip: You don’t need one, but it will save you some dishes if you make this in a dutch oven because you can saute everything in the dutch oven, then also simmer in the same pot. You could get away with just sauteing in a regular pot as well. Up to you but I like to be efficient (read: lazy) when it comes to dirtying dishes. 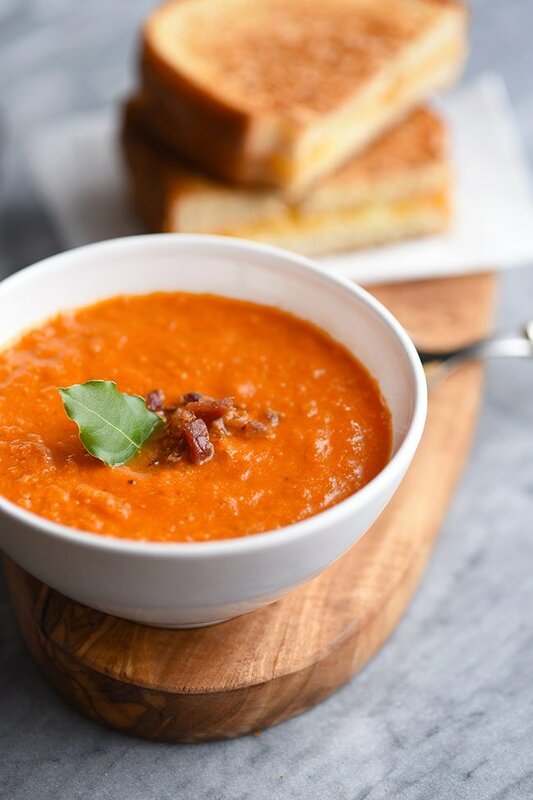 This roasted red pepper tomato soup was featured on Hearth and Soul and South Your Mouth! This soup sounds as incredible as it looks. Pinned as we are having a hot spell here in Southern England! Great post.